"Do you like puzzles? Well if you do, you should like this game..."
Welcome to Shapeshifter, where you have an unlimited time to shift shapes around until the shapes are shifted the way the shapes are supposed to be shifted... if that makes sense... Before you begin, Sinsi recommends you to read the rules here before playing. Basically, you must place shapes (they have to fit completely!) on the board, and any symbol below the shape shifts to another shape. Your goal is to have all the shapes turn into the goal shape. The only thing to change is the top left and top right symbols, right? However, let's look at the available pieces. 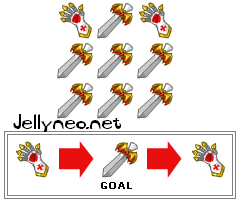 That won't work - there's no single spot that can be changed to make everything turn into a sword. Let's try the top row now. Now, you could place the single square over the glove to complete it. Once you've thought it out, act it out. Place the single square at the middle-top square and the long bar across the top. The level is solved! Now, before you begin solving, here are some additional tips. It isn't cheating to use paper and pencil. In fact, any material will do; from nickels and pennies to CDs and floppy discs. Like stated before, you can work it out in any order you like. Sometimes the pieces even cancel each other out. If you are completely stuck, take a break or ask a friend. Remember that if you fail to reach the goal, you lose nothing. You simply restart the level with a new puzzle. Remember that the puzzles get harder every round. You'll have to cope with smaller and more pieces each level. If the avatar isn't showing up after level 5, try going back to the main Shapeshifter page via the Explore and Meridell maps. If that still doesn't work, check your avatar list in your chat preferences to be sure you don't already have it. After level 10, the board grid becomes 4x3, after level 20, the board becomes 4x4, and after level 25, you must rotate through three different shapes per round. But don't let that make you quit! From levels 71-80 the active piece is not visible when placing it. This ends after level 80 and is visible on level 81. Practice makes perfect. If you continuously practice shifting shapes, you might make the high-score table! There seems to be a limit to how many Neopoints per day you can win by playing Shapeshifter! It appears to be in the vicinity of 5000 to 6000. You may wish to keep this in mind if you are playing for a trophy. Enter a level to see your prize!